A warm and cosy retreat in winter, a cool and refreshing sanctuary in summer – come and indulge your senses at Cape Lavender Teahouse, just a short five minute drive from Yallingup in the renowned Margaret River wine region. Here you can enjoy our famous traditional Devonshire Teas, with a choice of delicious homemade scones, fruit preserves with a hint of lavender and double whipped cream, or a cup of our fine locally roasted coffee. If it’s cold outside, snuggle up by the open fire and share a bowl of piping hot soup. On a beautiful spring day, delight in the scent of the many varieties of fresh lavender grown close by. Traditionally, this plant has been used as a herbal remedy, to relax, soothe and heal the mind and body. The oil extracted from lavender is one of the gentlest in nature, perfectly safe to use undiluted on even the most sensitive skin. At Cape Lavender Teahouse, you’ll find an extensive range of handcrafted lavender-based products, perfect as gifts for that special friend back home, or to indulge yourself and bring back memories of a delightful day in this very special part of the world. I feel compelled to write and tell you how impressed I was with Cape Lavender. Everything was perfect ... the presentation, the service, the price, the value for money etc etc. Congratulations and thank you. I purchased a jar of your lavender face cream and may I tell you how beautiful it is. I am chemically sensitive and suffer from scleroderma and have tried just about every product on the market. Your face cream is the only product that softens my hardened skin and yet also helps relieve the redness. It is even OK for me to use around the eye area. I can tell you this face cream is the best product I have ever used and I will recommend it to the scleroderma foundation in Australia and USA. One of my customers suffered very bad burns in a car accident about 4 years ago. She still experiences discomfort and tightening of the skin and says the only thing that helps is Cape Lavender Bath Oil. So thanks for getting the order to us so quickly. My young son has a long term hip disease and I tried Cape Lavender Arthritic Balm. He now uses it every night as he feels it really helps him. I have had terrible trouble sleeping for most of my adult life. I am now 68 and last year someone recommended Cape Lavender’s Sleep Balm to me. What a revelation! I now sleep right through and don’t know how I ever managed without it! Thank you! Natural lavender essential oils, lavender skin and lavender body products handcrafted with care in Margaret River, Western Australia. 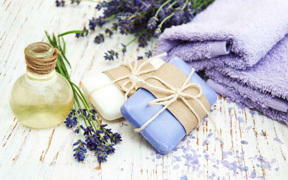 For centuries man-kind has used lavender to relax, soothe and heal. Ancient medical texts extol its healing powers and today’s chemists and scientists have confirmed conclusive evidence to support their beliefs. Help spread the word and get the latest Cape Lavender updates.